This pack consists of a series of alphabet and phonic cards designed to develop letter recognition and letter sound relationships. The pack includes posters and games showing alphabet (upper and lower case letters) blends, consonant clusters and digraphs. All can be printed out and laminated, some could be used as an interactive slideshow or inserted into a workshop. These cards have the upper and lower case letters. All graphics by Jacqui Sharp. 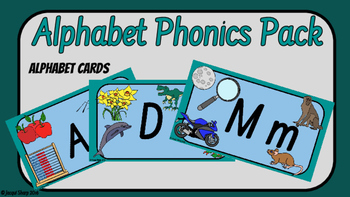 Alphabet Cards: Print these cards out, laminate and put up on your wall or use them in your group teaching. Project these cards up onto a screen and use them for letter recognition practice. 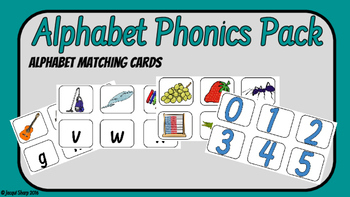 Alphabet Matching Game: Print out, cut and laminate these cards. Mix the cards up and get students to match the letter to the pictures. 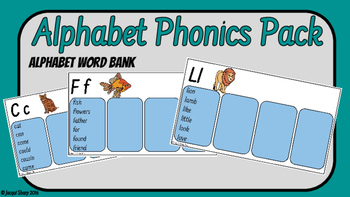 Alphabet, blends and vowels: Print out, cut and laminate these cards. Students use them for reference when they are writing. 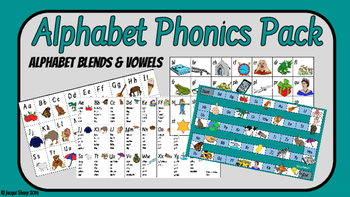 Play the alphabet and blend games.